Show your support by making a year-end donation today. Your gift will help us help more farmers—like BrennaMae and Brandon. We all have a stake in working farms. Since 2004, Land For Good has helped hundreds of farmers access farmland while thousands of acres of land have remained in active farming. Entire communities benefit from increased farming opportunity, healthy lands, and a more secure food supply. Food security depends on farmer security. And farmer security requires land security. 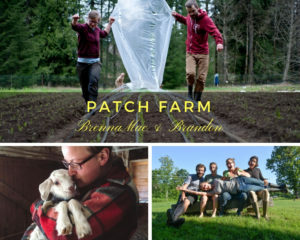 BrennaMae and Brandon now own their dream farm, Patch Farm of Maine, with the help of Land For Good—and supporters like you. This was it, the property that we were so clearly meant for, that we had patiently waited to find,” recalls BrennaMae Googins. They knew that finding land was just the beginning. Gaining secure tenure to make the farm their own would take patience, compromise and support. They reached out to Land For Good for guidance about how they could own their own land. Read their full story. This is where you make a critical difference. Your every gift helps sustain farms, farmland, and farming across New England! We applaud your support of keeping farming a vital and vibrant part of our communities. Together we work toward a future with MORE farming, healthier lands, and a more secure food supply. Please join with us and donate now. When you join with us to tackle farmland access and transfer, you’re making a foundational investment in local farming, working landscapes, and food security. Your support helps us directly assist hundreds of farmers, farm families, landowners and communities every year. At the same time we work to promote the changes needed around land access, transfer and tenure; changes that are key to the future of food security, farming opportunity, and land stewardship in our region. If you believe that farming and land stewardship are vital to New England’s future, then join with us. As a not-for-profit charitable organization supported by grants, donations and fees, we rely on supporters like you to get more farmers on more land – and keep land in farming. Please give what you can. Every donation counts. Online: Use the Donate button to make a secure, online donation. Make a one-time gift or become a subscribing donor by setting-up automatic, recurring donations. Mail: Mail your check (payable to “Land For Good”) to PO Box 625, Keene NH 03431. To provide additional instructions or pay by credit card, please download, print and mail your completed Donation Form. Phone: Call us at 603.357.1600 to make a donation by phone. If you reach our voice mail, please leave a message and phone number so that we can call you back to process your donation securely, or to answer any questions. Matching gifts: Does your company have a matching gifts program? Many do so check out how you can increase the impact of your gift with the help of your employer. Contact your employer for a matching gift form and mail the completed form to us along with your donation. Named gift: Celebrate a birthday, promotion at work or special accomplishment by making a named gift in someone’s honor! A donation can be used to congratulate or honor special events or people in your life. We will notify the honored person with a card and your good wishes. Download our Donation Form and mail it in. Questions? To discuss other giving options or to make donations in-kind, of stock or by bequest, please contact us directly by email or phone (603.357.1600). Land For Good is a tax-exempt, charitable organization under IRS Code Section 501(c)(3). Our tax ID number is 02-0530711 and your gifts are tax-deductible to the fullest extent allowed by law. Our work is regularly reviewed, assessed and required to document that we meet the highest standards of public and fiscal accountability, and program cost-effectiveness. You can download our most recent (2015) Federal tax filing (IRS Form 990) and Independent Financial Review. We are a Guidestar Exchange Silver participant, demonstrating a commitment to transparency. Through Guidestar you can access previous years’ financial reviews and Form 990s along with other information. To access our Guidestart listing, visit Guidestar.org and search “Land For Good” or our tax ID number (02-0530711). We value your support – and use it wisely to maximize its impact.